Figure 15.2. Generalized sequence of events in the process of initiation of translation, with two possible pathways of the initiation complex formation. (1): Association of the small ribosomal subunit with proper initiation factors (mainly IF3 or eIF3) resulting in the removal of the subunit from the two subunits association/dissociation equilibrium (formation of the "native" subunit). (2): Association of the small "native" subunit with either mRNA (leftpathway) or initiator tRNA (rightpathway). (3): Binding of initiator tRNA with the mRNA-associated subunit (leftpathway), or association of the initiator tRNA-carrying subunit with mRNA (rightpathway), both resulting in the formation of the small subunit initiation complex. (4): Joining of the large ribosomal subunit to the small subunit initiation complex and the release of initiation factors. Initiator tRNA is positioned in the P site of the ribosome. (5): Binding of the first elongator aminoacyl-tRNA to the A site of the ribosome. The next step of initiation is either the association of the "native" small subunit with mRNA, or the binding of the initiator aminoacyl-tRNA to the "native" subunit. If the second step is the association with RBS of mRNA, the ribosomal subunit can seemingly move randomly along the polynucleotide chain for a short distance, as in the case of Prokaryotes, or unidirectionally (5' to 3') for a longer distance in the case of Eukaryotes, searching for the initiation region. It is followed by the binding of the initiator aminoacyl-tRNA which determines the final settlement of the complex (small ribosomal subunit with initiation factors and initiator aminoacyl-tRNA) at the initiation codon; this is the third step of the initiation process. The alternative way is possible when the second step is the binding of initiator aminoacyl-tRNA to the small ribosomal subunit, followed by the step of association of this complex with mRNA and search for initiation codon. In both ways the result is the formation of the so-called ribosomal initiation complex (see Fig. 15.2 steps 2 and 3). It is 30S:(IFs):F-Met-tRNA:mRNA in the case of Prokaryotes, or 40S:(eIFs):Met-tRNA:mRNA, also called 48S initiation complex, in the case of Eukaryotes. The penultimate step (Fig. 15.2 step 4) is the interaction of the large ribosomal subunit with the above initiation complex. The interaction is accompanied by the hydrolytic cleavage of the IF2 (eIF2)-bound GTP and the release of the initiation factors from the small ribosomal subunit. The step completes with the formation of the whole 70S or 80S ribosome carrying the initiator aminoacyl-tRNA in the P site and having the vacant A site. In Eukaryotes special factors (eIF5 and eIF5A) promote this step. The final step is the acceptance of the first elongator aminoacyl-tRNA at the A site and the formation of the first peptide bond. At the same time this is the start of elongation. At least three features of the prokaryotic organization underlie the main peculiarities of the translation initiation process in Prokaryotes. (1) Due to the absence of a membrane-isolated nucleus, the processes of transcription and translation are not separated spatially in the cell. Nascent mRNA chains, still attached to the RNA polymerase complex, are accessible for the interaction with ribosomal particles and thus competent for initiation of translation. In this way the coupled transcription/translation process takes place (Fig. 15.3). (2) Prokaryotic genes are usually organized in polycistronic operons that are transcribed as whole units into corresponding polycistronic polyribonucleotides (polycistronic mRNAs). Initiation may occur independently on different coding sequences (mRNA cistrons) of such long polyribonucleotides, this requiring the mechanism of internal initiation (Fig. 15.1 B). Moreover, in order to provide for differential productivity of different coding sequences, the mechanism of discrimination of mRNAs and cistrons within the same polycistronic mRNA by initiating ribosomal particles has been developed in Prokaryotes (see Section 16.2). The discrimination is based on differential affinity of the particles for ribosome binding regions (RBS) and results in differential rates of initiation. 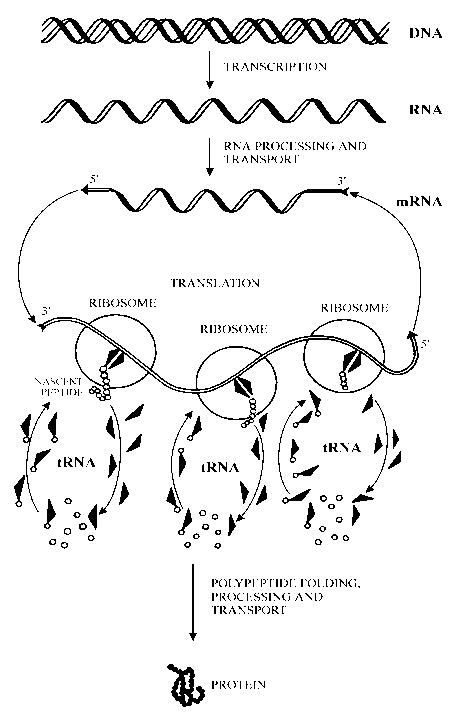 (3) The prokaryotic mRNA is presented to translation initiation machinery as a self-folded entity, with its intrinsic secondary and tertiary structure, in contrast to the eukaryotic mRNA which is organized in mRNP particles where the RNA folding pattern may be significantly modified by RNA-binding proteins. A number of structural requirements should be met for the complex between the initiating 30S ribosomal particle and a section of mRNA to be effectively formed (for reviews, see Stormo, 1986; de Smit & van Duin, 1990; van Knippenberg, 1990; Gualerzi et al., 1990; Voorma, 1996). First of all, this section should not be hidden within a stable secondary and tertiary structure of mRNA (though unstable hairpins often involve the ribosome initiation regions). Ideally the ribosome-binding site (RBS) of mRNA should avoid folds and hairpins, i.e., be "unstructured". Figure 15.3. 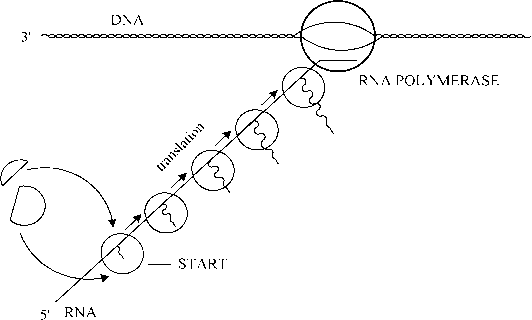 Schematic representation of the coupled transcription/ translation in Prokaryotes. CCUCCU sequence of the 3' terminal region of 16S RNA (in E. coli) that is complementary (although often in part) to the polypurine pre-initiation sequence of mRNA. Several examples are given in Fig. 15.4. This complementary pairing of the 3'-terminal region of 16S RNA (ASD) with the Shine-Dalgarno sequence (SD) seems to participate directly in the association between the initiating 30S ribosomal subunit and the ribosome-binding site (RBS) of mRNA. It should he pointed out, however, that the initiation of translation is also possible in the case of mRNAs lacking the Shine-Dalgarno sequence. For example, the mRNA coding for the cI repressor of the phage l does not have such a sequence before the initiation codon; even so, the initiation is observed, although it is not very effective. Among bacterial (E. coli) gene transcripts, about 2 to 3 % of presumptive messages seem to have no patent Shine-Dalgarno sequences. Also bacterial ribosomes may perform initiation with certain eukaryotic mRNAs devoid of the Shine-Dalgarno sequence. It may be concluded that the Shine-Dalgarno sequence contributes greatly to the effective association of the ribosomal particles with mRNAs, but probably is not an absolute requirement. In the case of a polycistronic mRNA, the ribosome after termination at the preceding cistron may pass to the non-translating state and dissociate into its subunits, but the 30S subunit may remain in association with mRNA for a time. Then, it can either be released from mRNA, or slide phaselessly along intercistronic region and reinitiate at the next cistron (see Section 16.3). The chances of reinitiation without dissociation of 30S subunit from mRNA seem to be greater with shorter and less structured intercistronic regions (de Smit & van Duin, 1990). If the ribosomal particle passes from termination at the preceding cistron to reinitiation at the next cistron without dissociation from mRNA, it may less strictly require the Shine-Dalgarno sequence for the reinitiation. Generally, the nearby termination event may strongly increase the efficiency of the subsequent initiation (reinitiation). In many cases the independent de novo initiation (by free ribosomes) of an internal cistron with a poor Shine-Dalgarno sequence is found ineffective, while the reinitiation following termination of the upstream cistron (translational coupling) proceeds at a high rate.